The annual CAT Awards have taken place at the new venue of the Lowry Hotel in Manchester – known to sports fans as where José Mourinho lives. More than 120 professionals from across the aftermarket enjoyed a networking session and a lunch before the Award ceremony. 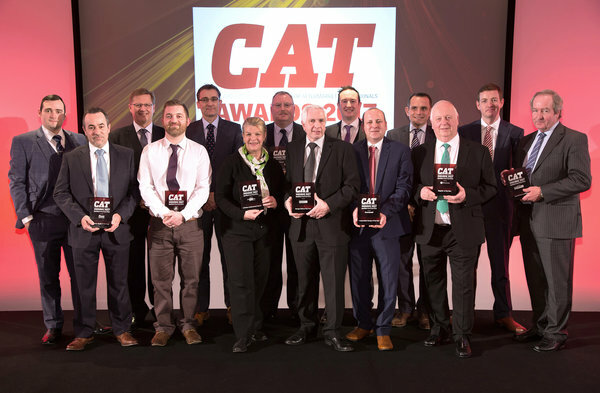 Over the past ten years, a CAT Award has become the aftermarket’s most coveted trophy. The prizes are given in eight categories, which include recognition for motor factor chains as well as for individual teams, as voted for by CAT’s readers. There is also an Achievement Award, which recognises an individual that has made an outstanding contribution to the aftermarket. This year, the Award went to Wendy Williamson, the Chief Exec of the Independent Automotive Aftermarket Federation trade body in recognition for her work in representing the sector to government and to the public. CAT Editor, Greg Whitaker said: “The number of votes cast in the Awards was the highest we’ve ever had. Excitingly, the margin between first and second place in two of the categories is the narrowest it has ever been. My thanks go to all the sponsors, nominees and readers who made the event a success”. Following the Awards lunch, networking continued with the CAT team until the small hours of Saturday morning.